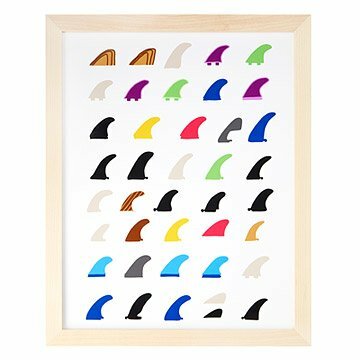 This beachy print by Jorey Hurley celebrates the surf. Perfect for the beach house or your favorite wave chaser, this beachy print celebrates the surf. Illustrator and children's book author Jorey Hurley finds endless inspiration in life's extraordinary ordinary moments and creates a drawing every day based on her encounters, including this scene. Sitting in the sun and waiting for their adventures, these flashy fins sings in the colors of summer. Characterized by rich, flat colors and stylized subjects, her vibrant, blocky images show the influence of her work in textile design. Printed on matte heavyweight cold press paper with archival inks. Made in Oregon. Illustrator and children's book author Jorey Hurley finds endless inspiration in the beauty of everyday life and draws something (almost) every day. She graduated from Princeton with a degree in Art History, earned a law degree from Stanford, and went on to study design at FIT. She worked as a textile designer in New York City for five years, and currently lives in San Francisco with her family. "Ultimately, the best preparation for my work has been a family chock full of artists: my mother is a sculptor, my brother is a photographer, my father is a filmmaker, my husband is an architect, my grandmother was a bronze sculptor and both grandfathers were painters," she says. Framed: 15" H x 12" W, Print: 14: H x 11 W"